Too much stress at work? Or maybe you're tired of Nashville traffic? If you have an axe to grind, Flying Axes is the place to do it. NASHVILLE, Tenn. (WTVF) — Too much stress at work? Or maybe you're tired of Nashville traffic? If you have an axe to grind, Flying Axes is the place to do it. "We’ve got a great little community here. We have Fort Houston, the loading dock, there’s a couple salons," said Taryn Lytle. Lytle is the General Manager of Flying Axes Nashville, now operating out a space in the Wedgewood-Houston area. "We call them cages. We have eight cages, two lanes per cage. There are four here in the front and four directly behind," she said. 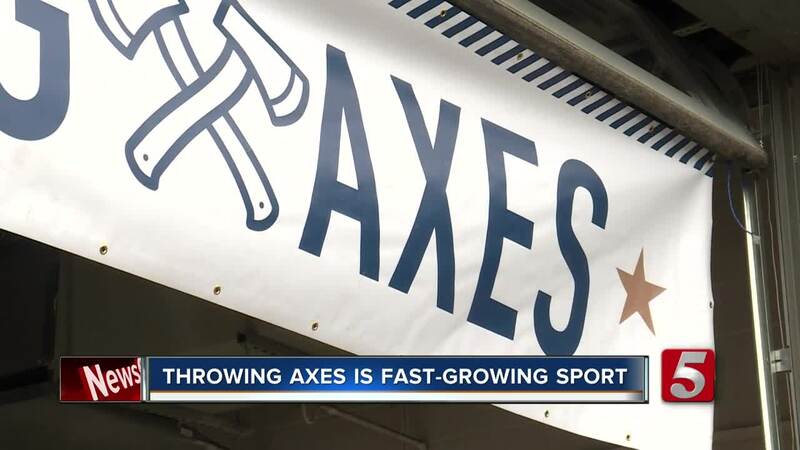 Axe throwing is a fast-growing sport. Players compete by throwing axes at wooden targets. "Once you get the hang of it it’s very therapeutic," she said. Each target can take about eight hours of play before it needs to be replaced. Unlike other venues, Flying Axes boasts electronic scoreboards so you can track your progress. Lytle says they have coaches on-hand to get you good -- fast.